U.S. President George Bush (2nd R) and Vice President Dan Quayle (2nd L) stand with their wives, Marilyn Quayle (L) and First Lady Barbara Bush (R) on the podium at the 1992 Republican National Convention. Several Kentuckiana leaders, including former Vice President Dan Quayle, are joining the nation in mourning President George H.W. Bush. LOUISVILLE, Ky. (WHAS11) — Several Kentucky and Indiana leaders are joining the nation in mourning the passing of President George H.W. Bush, who passed last night at the age of 94. Indiana senator and former vice president under Bush Dan Quayle said the president was a completely genuine, decent and honorable person. 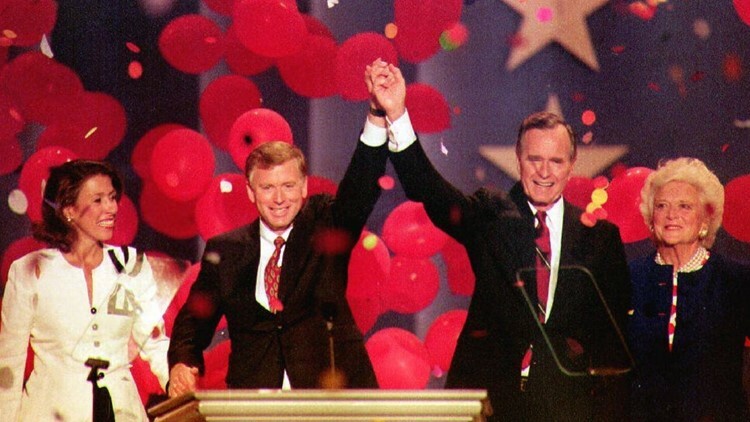 "I have often told my children 'If you want a role model in your life — look to President George Herbert Walker Bush," Quayle said in a statement. "The world mourns the loss of a great American. But, it also celebrates a life well lived." Senator Mitch McConnell started his senate campaign in 1984 while Bush was working as vice president under President Ronald Reagan. ““This devoted father and decorated patriot spent decades serving his country, from the skies above the south Pacific to our nation’s highest office," a statement released by McConnell said. In his statement, McConnell praised Bush as a CIA Director, Ambassador to the United Nations, vice president and lastly, as a president. “George Bush built his life on the premise that loving and serving America was simply a citizen’s duty. He fulfilled that duty time and time again, as completely as anyone could. His legacy will rank among the most distinguished statesmen our nation has ever produced," McConnell said. Mitch Daniels, current Purdue president and former governor of Indiana and member of George W. Bush's cabinet tweeted, "Thank you, GHWB, for your life of service, courage, and patriotism. A nation that produces leaders of character and values like yours cannot fail. The converse is equally true. R.I.P." Thank you, GHWB, for your life of service, courage, and patriotism. A nation that produces leaders of character and values like yours cannot fail. The converse is equally true. R.I.P. Kentucky Governor Matt Bevin also tweeted about Bush's passing, saying "President George H W Bush has passed away at age 94...May he Rest In Peace...The prayers of many in Kentucky and across our nation are with the Bush family tonight..."